In Arabic we have a proverb that says beware the wrath of the patient. When Egypt rose against the tyranny, oppression, and widespread rooted corruption that had been governing it for three decades it was as if Sphinx had suddenly come to life and rose from his eternal rest. We toppled the president, a man known for his involvement in much of the plight of the Palestinians, if not his own people, but we still don’t feel that it’s over. Even before January 25, the day the revolution began, we had a series of little protests and semi-free press that criticized Egyptian domestic and foreign policies on a number of issues. Some journalists, although jailed later, criticized the person of the president. We expressed ourselves, but we were jailed, arrested, and tortured. The Libyans have none of that. And they’ve had none of that for 42 years, not 30. I visited Libya in 2007 in a small attempt with a friend of mine to do some “Arab tourism,” visiting a fellow Arab country and seeing it through the eyes of a people who wanted to learn more about their immediate neighbors, with whom we share so much. There was not a single day that passed without meeting a person who was either half-Egyptian or married to an Egyptian. Everyone was extremely kind, peaceful, calm. Nothing like what much of the media had tried to show of the Libyan people in many years that passed. Posters of Qaddafi filled every street corner in such a way that made Mubarak appear quite benign, modern, civilized, and democratic. It was the 38th year of the coup d’etat which Qaddafi liked so much to refer to as a revolution. Larger than life images of him greeting his people, with the number 38 shamelessly plastered next to him. We focused much of our trip on Benghazi, the land of the Sanoussis, the ousted royal family whom Qaddafi continued to despise, showing his hatred to the past with exaggerated and appalling neglect for the city. Streets were poorly paved, much of the buildings affected by the coastal weather were left unpainted for years. Government buildings were rundown, with broken windows left unfixed. Benghazi was a beautiful, neglected stallion ready to spring the minute it broke free of its curb. People there were mostly silent. We were warned beforehand that it would not be wise to speak politics with any person. We were given the chance to visit the grandson of Omar Al Mukhtar, the legendary freedom fighter who fought the Italian invasion in the early twentieth century, now an elderly sheikh with an open lounge for students and visitors paying their respects. I was especially curious to listen to his views on the situation in the Middle East, especially after the 2006 war in Lebanon had just ended. The man’s eyes widened and he became extremely tense, refusing to talk to me, while men surrounding him decided that my friend and I were no longer welcome in the place. Qaddafi does not just oppress dissent, he refuses the mere concept of opposition. Educators, professionals, writers, and many more skilled Libyans are living abroad. And outside Libya, if they oppose his regime he hunts them down and kills them. If you’ve ever tried talking to a Libyan about the truth of the Libyan regime prior to the current uprising you would know what I mean. Qaddafi haunted his opposition even in their dreams. The more I watch the media the more evident the size of the horror gets clear to me, and that’s not just because of the sight of dead bodies or severely injured civilians. It’s because of the quivering voices of the anonymous eyewitnesses that can’t fight back their tears as they plea for help to the outside world, be they men or women, young or old. It’s in the shivering jaws and hands of the old opposition Libyans living in the UK, the US, Germany, and virtually most countries on the planet except their own, as they spoke with mixed emotions of grief and pride, their eyes wide in disbelief as they saw the liberation moment coming so close. Those silent people who couldn’t even speak about the regime even in exile were now exploding with horrors of the past they had witnessed, and appealing to the world with their plight. I’ve seen it in my own country. If the fear is broken nothing else brings it back. If the wall of silence crumbles nothing will ever build it again. And it is crumbling everywhere in the Arab world, exposing the ugliness of the savage rule it had been subjected to for decades. And the Libyans, those amazing people who can teach the world lessons of patience, are bound to show the world how they will present their lives to the mad beast that dwells among them. It is their only gate to the world outside. I’ve been feeling so trapped inside my body. There’s a bundle of emotions swirling around me, so dramatized by all I’ve seen, that I feel so drowned in its deep waters. It’s been 26 days now and I still have not been able to tell my story. But I know I need to get it out fast before the memory starts to fade away, before I finally ride up on one of the strong tides that keep pushing me adrift off and away from the shore. Ever since it all started I’ve been shrinking in my own eyes. It’s like when a cat is suddenly face to face with a lion – wherever that might happen – and suddenly realizes its own insignificance. The silence that overcame me crept into my inside, making me doubt whatever I might want to say or share, believing it would by far be less significant than what many others had to say, or have already said. But I will try. It’s my experience, and this is my blog, so feel free to search elsewhere if it doesn’t grab you! I arrived back home in Cairo on January 24, one day prior to the scheduled protests on the 25th. I had been in Saudi Arabia for three weeks with my mother’s family. I had by then managed to train myself to shed off much of the pains and sorrows of the past and to wake up each morning with a fresh look towards a new day. I overate, overslept, overindulged myself in perfumes and nail polish. My busiest times were the times I sat to read a book of my choice. I had deliberately chosen to stop following political events around the world, I had started to doubt whether I actually wanted to have a career in political science or even the media to begin with. I no longer cared what happened in Egypt, because all the events sounded the same, and all the results were boringly predictable. There was the corrupt government whose mummified faces didn’t seem to be going anywhere. There was our ridiculously unprofessional state-run media blabbing away about the divine qualities of the president, his family, and his associates. And there was the usual handful of activists, intellectuals, and professionals who wanted change. This handful of lone protesters always seemed to be standing on an island of their own. They weren’t many when compared to a population of over 80 million people, but they were working day and night to empower the poor and the workers. Their morale did fade sometimes, their hope did become a vague, unrealizable dream, but they continued to work the way a street sweeper continued to sweep, even though passersby threw trash right after he finished. And it was no accident that those protesters were standing on an island. They were quite literally placed on it. With police forces three times the size of our army, few Egyptian streets were void of police officers or truckloads of guards parked near a university or a mosque, ready to quell the faintest sign of ‘unlawful’ assembly. So a demonstration of 200 people would be surrounded by a thousand uniformed guards, tens of plain clothes officers, dozens of sunglasses and mobile phones, and officers of so many ranks I lost track of. It would not be allowed to march, but remain cornered in place, like caged animals in a zoo, while passing cars would slow down to try to hear what the chants were saying to no avail. This lasted for as long as I could remember for the past 30 years of Mubarak’s regime. This was the people’s only channel to speak directly to the regime in an attempt to be seen and heard by all, not just the educated elite or even merely those who could read newspapers. With this background I eyed the call for the January 25 protest with so much doubt and skepticism. I had the burden of the years behind me, of the scenes and the frustrations that never seemed to cease. And I did not believe that change could be brought about with an appointment, setting date and time to take the road against oppression. Revolutions didn’t happen that way. They were spontaneous. They had to be spontaneous. They weren’t a rendez-vous with freedom. I woke up on the morning of the 25th feeling lazy, and guilty for being lazy. My friend Nadia called and insisted that I go, so I got off the bed because I knew that I would not be able to live with the guilt of not being out on the street on that day. As I later found out, we were like many other skeptical Egyptians who were going out of a fading sense of duty. We knew there was nothing else we could do if we wanted any change. So the step now was to decide where to go to begin the demonstration. A number of places had been discussed by those who said they’d participate. 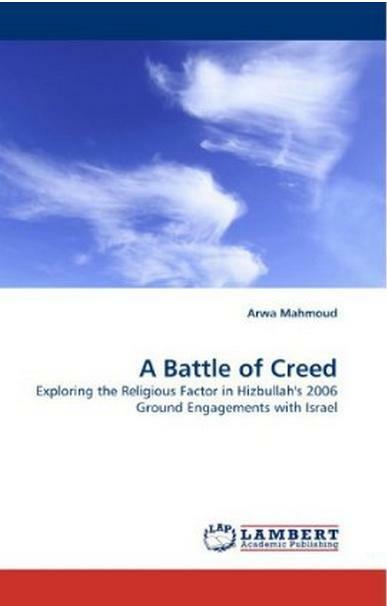 Some had planned to have breakfast in a chic cafe in an upper class neighborhood and move from there – adding much to my already skeptical attitude – and others had decided to begin in Shobra, a busy, crowded neighborhood known for its mosaic of inhabitants, from Christians to Islamists. So Nadia and I opted for Shobra. We wanted hot events and we wanted to see them for ourselves. 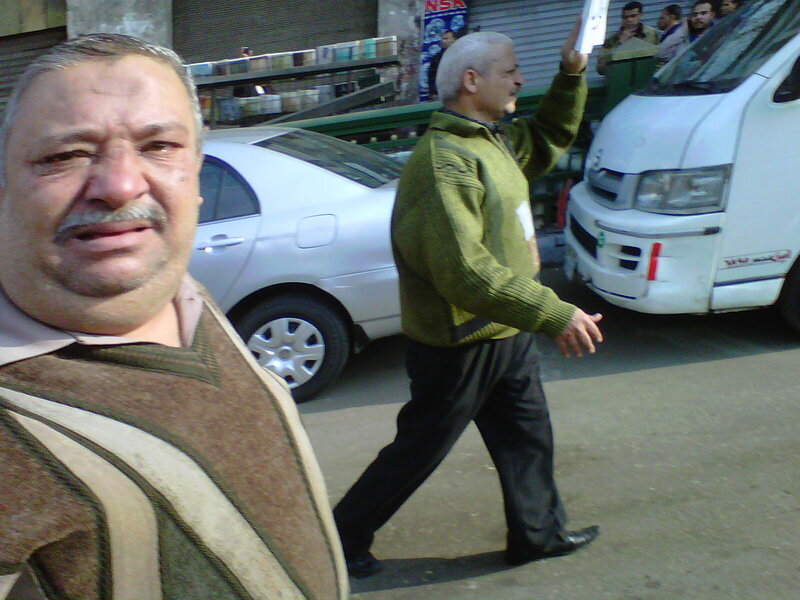 I sent my first tweet that I was on my way to the demos and received a phone call from my friend Adel. “You’re going to the demonstration?” He asked with excitement. All I could think of was to control all my replies lest I horrify the taxi driver. I couldn’t wait for Adel to hang up so that I could SMS him on why we wanted Shobra or why I spoke to him that way. I could not resist taking a quick picture of this man. He was sobbing as he chanted and joined the protest. We arrived in the main square in Shobra. Neither we nor the taxi driver had ever been to the place and we didn’t know how to find it, but the sight of an increasing police presence told us we were close. Someone pointed out to us that it was further ahead, and the minute we reached it we knew we were in the right place. Dozens of police trucks were parked on the sides, dozens of plain clothes men in dark sunglasses, dark coats, and neat haircuts had pulled up plastic chairs and sat on the sides of the road, believing that that way they could actually blend among the people. Those were the famous Amn Dawla, the humungous state security apparatus that had been terrorizing political activists for decades, bullying all dissidents whenever they felt like it. Men in uniforms of too many ranks stood talking to their radio receivers, barring some shops with iron bars and helmeted guards. And there was not a single protester in sight. Like many other Egyptians, the mere sight of heavy police presence unnerved us, because we knew that under the emergency law that’s been ruling the country for 3 decades, they could easily pick us up off the street and arrest us for no apparent reason other than being physically there. We kept walking back and forth with no place to go until we decided to settle in a restaurant and wait for Adel to join us. That way, maybe we wouldn’t really attract too much attention. Adel arrived and asked the police to allow him into the restaurant, signaling with his hand that he wanted to buy a sandwich. We were all oblivious to the oddity of people deciding to just hang out in a restaurant under police siege. Time passed and nothing was starting. Action was already beginning in that upper middle class cafe we had rejected, however. Nadia learned that our friends there were arrested right out of that cafe and carried in police trucks, only to be released in a far suburb away from the center of the city. We figured that plans where we were might have changed. Nadia was always inseparable from her mobile phone, following everything on Twitter. So she read that a protest was actually growing in downtown Cairo. We immediately took the decision to go there. We stopped the taxi and continued on foot, when suddenly we found ourselves in an overwhelming crowd of people marching in the streets, chanting against the government and calling for the fall of the president. 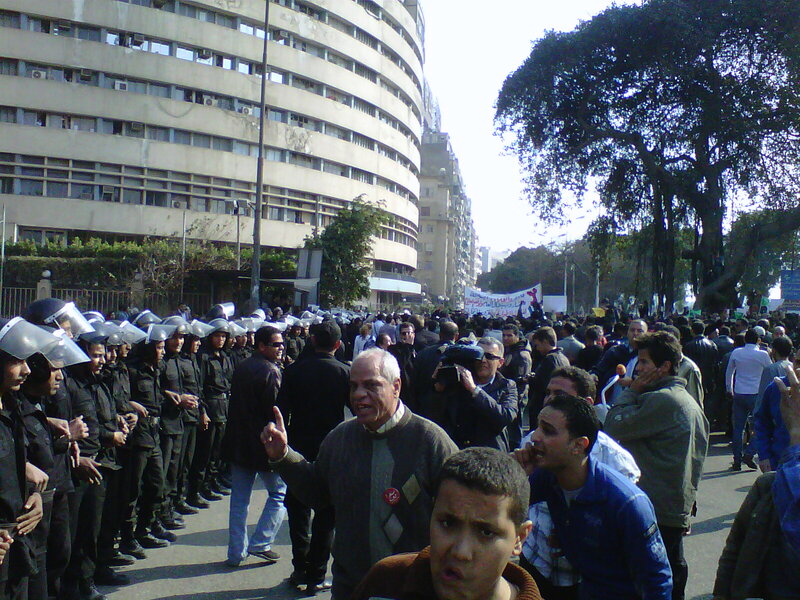 This was the first time I had ever seen a protest allowed to actually march in the streets of Cairo. An army of guards surrounds the state television building for fear of the protesters reaching it. We kept walking along with it, and people were standing in their balconies in all buildings watching. Others stood on the sides of the street like they were looking at a parade. It felt like one to me, because I had never seen such young fresh faces calling for freedom before. They were the kind of people that I only saw when Egypt won a soccer game. Suddenly those young men were rallying for change. Suddenly they were out, risking everything, for the right reasons. This march did not appear to have any leaders. Hundreds were growing into thousands, and the young were carried on shoulders in many groups, shouting the regime down. They seemed to come from every street, every alley. And the more time passed the more crowded it became. My heart was beating fast. The sounds of the crowds almost shattered the walls. And the protesters looked up to the windows, calling upon the people watching to come down and join them. They called for every person standing by to join. I could see people beaming at the protesters, eyes lit up, filled with joy and hope, yet standing pinned down to the ground, too afraid. As I walked along I could hear hums very near to me. I turned and found a middle aged man in tears and a look of disbelief chanting the national anthem. He had decided to join the march. 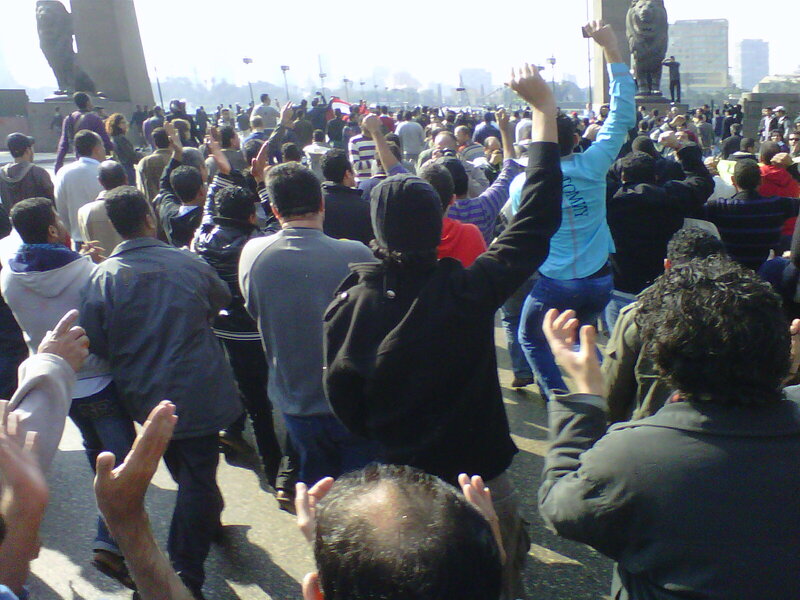 The destination of the marches in different parts of Cairo was Tahrir, or liberation, square. Being the largest in Cairo, the place holds special significance for both the people and the government alike. It was as if those who controlled it held the upper hand and were seen and heard by all. And as the crowds began to grow and the police tried to isolate marches from each other, I knew that there was no way the police would allow a soul into Tahrir. The larger the number the safer and more assured most people began to feel. They challenged the police to continue their marches to join those on the other side, and when they failed they spontaneously changed direction, in thousands, to another path leading to the same destination. The coordination was perfect. An advanced row would begin to shout to the back “Go back!” And it would be transferred from one row to another until an entire batch of at least a thousand or more people would change direction with no clash or division. Not being bound by a single group, Nadia and I were able to penetrate even to the side of the police, changing our occupations and purposes of being in the street as we went along depending on who asked us. One minute we were journalists, the other we were trying to get home. I could see that the situation was extremely tense on their side. I overheard an officer speaking on the phone, “This is only getting worse! We can’t handle these numbers!” The minute I heard that sentence I knew that the time had come. This was the time to do it. If not now then the chance wouldn’t come again, not for another 30 years. The crowds were finally able to enter Tahrir, pushing the police toward the ministry of interior building, by which time the police had redeployed throughout the street that led to it, pointing water hoses and using tear gas to disperse the crowds. Suddenly there were rocks flying in the air. We took shelter in a corner right at the street where the battle began. The further the protesters advanced the more cheerful they became, and soon they were joined by thousands more coming into Tahrir from all directions. Tahrir had become theirs. I stood speechless. 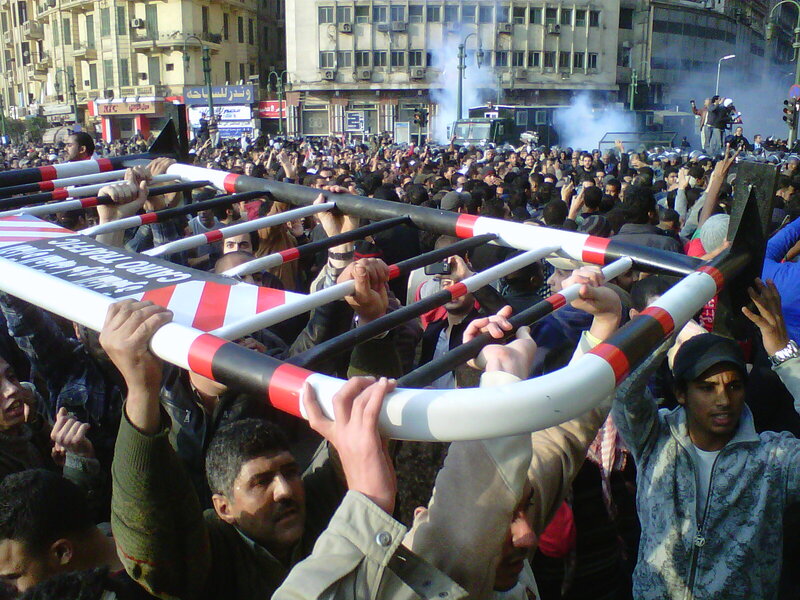 I left my home that day expecting a few hundred to be surrounded by an army of black-cloaked helmeted guards, and I found scores of people from all walks of life chasing the police out of Tahrir! I had never ever imagined a protest of this size or magnitude. And the amazing contrast of moods between the crowds and the police was what struck me the most. The minute I was among the protesters there was nothing but defiance and determination, yet among the police there was nothing but horror and panic. Something very big had happened in my country. The people were no longer afraid, the regime was.